Did you hear the one about Nelson Mandela, the pope, Mother Teresa and the Jew? Turns out they are the only non-Americans ever to have received both the Presidential Medal of Freedom and the Congressional Medal of Honor. The Jew? 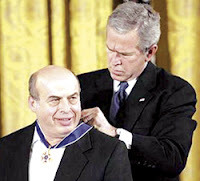 None other than our own icon of freedom, Natan Sharansky, the former refusenik and prisoner of conscience who earlier this month received his Medal of Freedom at the White House. I first met Natan in London a couple of years ago. He was on his way back from the U.S. where his new book, The Case for Democracy, had been highly acclaimed. 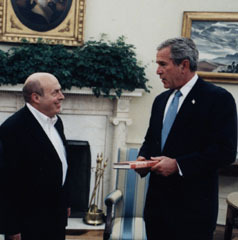 Sharansky saw the world divided between “free societies and fear societies” and said that free nations did not normally go to war against each other. He concluded that no Israeli peace agreement was viable until the Palestinian Arabs were truly free to live their own lives, freed from tyrannical overlords who have perpetuated their refugee status for political ends through intimidation and theft of humanitarian funds (dispensed by the U.S. and EU at the highest rate per capita ever known in the history of world aid). A man sentenced to 13 years in the Gulag for little more than expressing his national feelings as a Jew; man who showed such enormous resolve and charisma during that imprisonment that he endeared himself to his jailers and his name became known far beyond the walls of his prison. And then, suddenly freed, he emerges from the depths of a prison cell into the lofty chamber of the most powerful man in the world. The president of the free world wants to learn more of this man’s unique take on tyranny and the means by which to achieve peace. 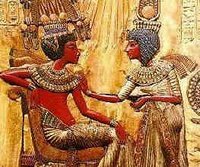 I thought of those words Pharaoh spoke after his meeting with Joseph, another gifted Jew delivered up from a dungeon into the palace of the supreme ruler. Joseph discerned that Pharaoh’s dreams were of critical national significance. He urged Pharaoh to make the most of the next seven good years, so that the nation might survive the following years of certain adversity. Pharaoh took the advice and, with the help of his new Jewish viceroy, Egypt emerged more powerful than ever before, having starved all its enemies into submission and penury. George W. Bush also had a nightmare – 9/11. In the aftermath of the attacks, his popularity was such that reelection was a certainty. At that point in time he had seven years of presidential power to defend the free world against the global jihad that would surely follow. For most of that time Bush did show the resolve and single-mindedness necessary to carry the mission through. He bombed the Taliban out of Afghanistan, chased Saddam into a foxhole and threw the Syrian army out of Lebanon. Other tyrants took cover and one, in Libya, actually decided to go straight. But then the president blinked. And in these past few weeks we have seen the tyrants sensing that weakness and boldly breaking cover with little fear of consequences. The Iraq Study Group has asked the leader of the free world to negotiate the fate of Iraq’s nascent democracy with two of the most evil regimes on the planet. To someone whose DNA is made up of Sharansky’s ideals, such a reversal would be akin to injecting oneself with an auto-immune disease. Iran and Syria are the perfect examples of Sharansky’s “fear societies” and the antithesis of democracy and freedom. George Bush still has another two years left in the most powerful office on earth. Two years that can either glorify his place in history or leave it utterly sullied. But at the end of those two years there will be an election and another parallel in biblical history. That single verse marked the end of Egypt’s glory days, an era that had been inspired by a Jew brought forth from a dungeon. And – with the same divine help – it would be another Jew by the name of Moses who would bring the once mighty nation to its knees and see Pharaoh and his army drown in the sea. The next two crucial years will determine if George Bush will be remembered as a Chamberlain or a Churchill. We can only hope he makes the right choices. But whoever arises in 2008 will need to have known Joseph. It seems that Santa Olmert has lots more in his sack of free goodies for our enemies. On top of the $100 million dollars he paid for the photo-op with Abbas, and the gift of thousands of automatic rifles for the unrepentant Holocaust-denier's 'Force 17' presidential guard, there now looks to be a unilateral release of hundreds of security prisoners. All of this bonhomie - as usual - for nothing in return. Not the release of our kidnapped soldiers. Or even the release of a letter or tangible sign of life and wellbeing. Apart from being the most incompetent and arrogant prime minister that Israelis never elected, Ehud Olmert has demonstrated, within his few short months in power, how very little he cares for ordinary Israelis: be they citizens or soldiers. No caring prime minister would have gone to the lengths of unleashing a bloody cossack attack on pliant settlers in Amona just to impress his wife and to show us how he could be tougher than even Ariel Sharon. And no caring commander-in-chief would announce the future surrender of settlement towns to our enemies even as their residents were fighting his disastrous war in Lebanon. What caring prime minister could contemplate releasing Marwan Barghouti? An unrepentant murderer of our people, sentenced to 5 life terms. It is a near-certainty that the release of this animal will not only bring about more killing but will also embolden other killers to take ever-greater risks in terrorising our people, knowing that they can be assured of due process and a life-sentence that means nothing. But why should Olmert care? He doesn't ride buses. He doesn't go to discos or buy pizzas. In fact he doesn't go anywhere that hasn't been sanitised by his security detail. And that security protection will be with him long after he has been kicked out of office. So, I challenge Mr Olmert to prove that he does care about the security of ordinary Israelis. Let him convince us that he is prepared to take the same risks as his citizens. 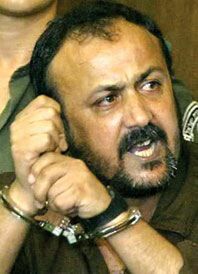 If he is so foolish as to release Mr Barghouti ... let him free one other prisoner the same day. Sir, - I had just finished reading your report of Olmert's $100m. gift to Mahmoud Abbas when the doorbell rang. It was my neighbor: Would I be prepared to donate money to her son's army unit for boots and winter fleeces? Charity begins at home. And to those who claim that this is the PA's own tax money, surely our government could legitimately deduct damages for the continued rocket attacks from PA territory. 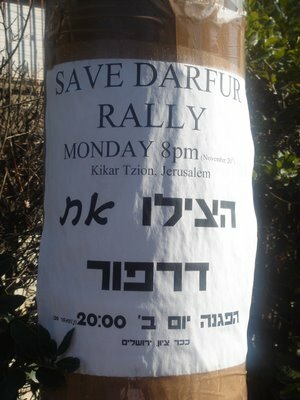 Witness this poster I saw this morning stuck to a lampost in Jerusalem. Not 100 yards away a white UN vehicle was double parked outside a cafe. In the hour it takes the guy to have his 'expense account' lunch, a dozen children will have died in Darfur, adding to the death toll still running at 10,000 a month. The hundreds of UN vehicles stationed in Israel are perhaps matched only by the hundreds of anti-Israel resolutions that discredited club of hypocrites has racked up over the years. Both factors suggest that this region is the center of the biggest hunanitarian crisis on the planet. It is of course not. It is simply the region that interests self-interested security assembly members most of all. Darfur, Somalia . . . all of them will always take second - or last - place whilst there is still a Jewish state to beat up on. But despite their own problems in the tiny and embattled country they call home, Israelis still have a warm place in their hearts for those suffering thousands of miles away. It is not just about starving and homeless children. It is about genocide taking place whilst most of the enlightened world looks the other way. More than any other people, Jews have firsthand knowledge of how that happens. If I had not been prompted by the lamppost to post this blog entry, I would not have found out about Jewish World Watch, an organisation which monitors these crisis regions and whose motto is: Don't Stand Idly By. See here how they have raised over a quarter of a million dollars to raise awareness on Darfur. Many of my correspondents will know of my campaign against the crackpots of the Neturei Karta. A campaign - I might add - that started long before their appearance at A-jad’s Holocaust circus. So far I have to resisted he temptation to mention them on this site, not wishing to sully my blog with these scumbags. The trouble with writers is that they just can’t resist a good line. It’s about NK “Rabbi” Ahron Cohen. 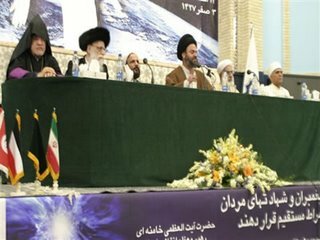 He’s the clown in the shtreimel pictured with his Nazi friends in Teheran. Ever since he returned from delivering his sermon to A-jad’s Holocaust convention, he’s had no end of trouble at his home in Manchester. Irate demonstrators have camped outside his home, proudly waving Zionist flags and regalia. They’ve stopped everything from his papers to his kosher milk. But what gets me is that the Manchester Chevra Kadisha cancelled his burial society subscription and refunded his payments to date. He lost the plot ! Driving home this evening I happened to tune in to BBC Radio 4 which was airing a 1-hour feature on the Shin Bet’s collaborators in the Palestinian territories. It was a fascinating insight into a system of rewards which have foiled so many suicide attacks on our people. I listened to a settler in Shomron who said he had known ‘thousands’ of collaborators. 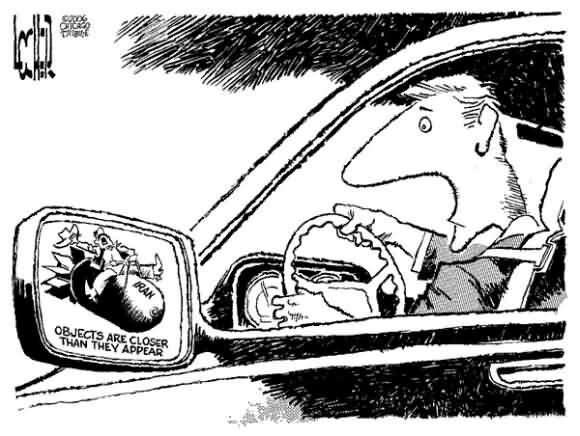 I was amazed at the low cost of inducements: just a few hundred shekels to tip-off a roadside bomb. I also heard collaborators complain, in disguised voices, how the Shin Bet reneged on their promises and abandoned them to their grisly fate in mob hands. I learned that one collaborator is executed in the PA territories every single day. If there are indeed many thousands of collaborators, able to save Jewish lives for the price of a wide-screen TV or a taxi license, why on earth is our government not taking the very best care of them? Is this not the best means of protecting our people at the same time as encouraging others in ever wider networks of sympathisers? Is not the engendering of trust and honour in this process the best means of encouraging moderates to rise against the extremists? Does this government get anything right? If you fail to stop Iran, understand that its threat to Israel now will surely be followed by similar intentions towards the rest of the free world. This is like saying: if I catch Ebola today, you will get it tomorrow. The other guy says: "Okay, I have time. Firstly you haven’t caught it yet. But if you do, I will have at least a day to get as far away from you as I can." Now that Bush has decided to abandon the Iraqis to mass slaughter and to allow Iran to go nuclear without the threat of any military intervention, Israel’s message needs changing. Israel needs to say to the world: If we get Ebola, so do you. The same day …the same hour … the same horrible death. America and the EU need to know that any non-conventional strike against Israel will result in an immediate counterstrike of such magnitude that the rest of the world shall not escape. This is unfortunately the only language world leaders will understand. This is clear from the crisis point in the Yom Kippur War when the Nixon administration was dragging its feet on the airlifting of arms and ammunition to a desperate Israeli army. It is not widely known that on the night of 8 October 1973 Golda Meir’s war cabinet decided to assemble 13 twenty-kiloton atomic bombs. The number and in fact the entire story was later leaked by the Israelis as a great psychological warfare tool. Although most probably plutonium devices, one source reports they were enriched uranium bombs. The Jericho missiles at Hirbat Zachariah and the nuclear strike F-4s at Tel Nof were armed and prepared for action against Syrian and Egyptian targets. It is also said that the nuclear missiles were wheeled out of their bunkers the following day, just as America’s spy satellites passed over the Judean hills. U.S. Secretary of State Henry Kissinger was notified of this on the morning of 9 October. Nixon immediately opened an aerial resupply pipeline to Israel, and Israeli aircraft began picking up supplies that very same day. Although stockpile depletion remained a concern, the military situation stabilized on October 8th and 9th as Israeli reserves poured into the battle and averted disaster. 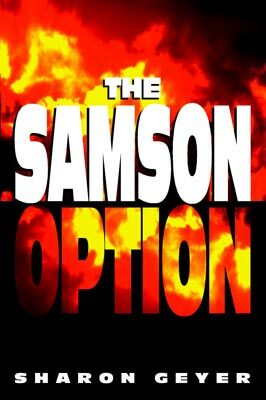 Israel’s nuclear capability has long been referred to as The Samson Option. This is because the biblical Samson vowed that if he were killed, he would take the Philistines with him. That’s precisely the message that needs to be sent to Western leaders who seem to be flirting lately with the notion of Israel’s expendability. This week Ehud Olmert forbade the IDF to respond to Kassam missile fire from Gaza, even where launching crews had been identified and could be stopped. This is not just to preserve the important "ceasefire" that exists only in Olmert's mind. It is to curry favour with visiting European officials who applauded Israel's restraint at a meeting with Tzipi Livni. Meanwhile the brave residents of Sderot have to risk their lives under the constant threat of Kassam missile fire from which the IDF is unable to protect them by government decree. All of which gives new meaning to the IDF as Israel's Deference Forces. I used to despise Yossi Beilin. Now I just feel rather sorry for him. It's not just for the guilt he carries for the thousands of casualties of Oslo. The man is now preaching that - if only we make peace with Assad and Abbas and give them the territory they want - the Arab world will become our loving trading partners and this will nullify Iranian aims to liquidate the state of Israel. I think the Hebrew word is: mizken. Reminds me of what we used to learn in school. About the speed of light and the speed of sound. That light travels faster than sound. Which is why people like Beilin can look intelligent. Until you hear what they have to say. The British Home Secretary has just launched a new inititative for all of us to invest in crime! 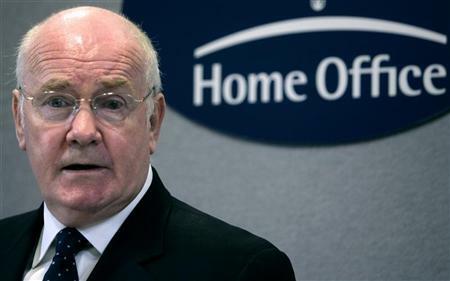 Having run out of prison cells, and the cash to build more, he has looked to the Invest-Hotel model to attact punters to buy a prison cell and rent it back to Her Majesty's government. A healthy rate of return is guaranteed by the UK's established track record of losing control of its borders and ensuring the maximum intake of riff-raff from the emerging EU states. Investors can be assured of overwhelming demand for prison places.